While you may still be finishing up your holiday shopping, we have a great gift idea for the wine or chocolate lover in your life. Why not buy them tickets for our annual Red Wine and Chocolate tour? We are hosting two fun weekends of sweet decadence and lush wine on Feb. 9-10 and Feb. 16-18 (Presidents’ Day Weekend) from 11 a.m. – 5 p.m.
Tickets may be purchased at participating wineries during the event. The $30 ticket and glass package entitles you to a special commemorative wine glass, complimentary wine tasting and delectable samples of chocolate at each winery during the Red Wine & Chocolate Weekends. 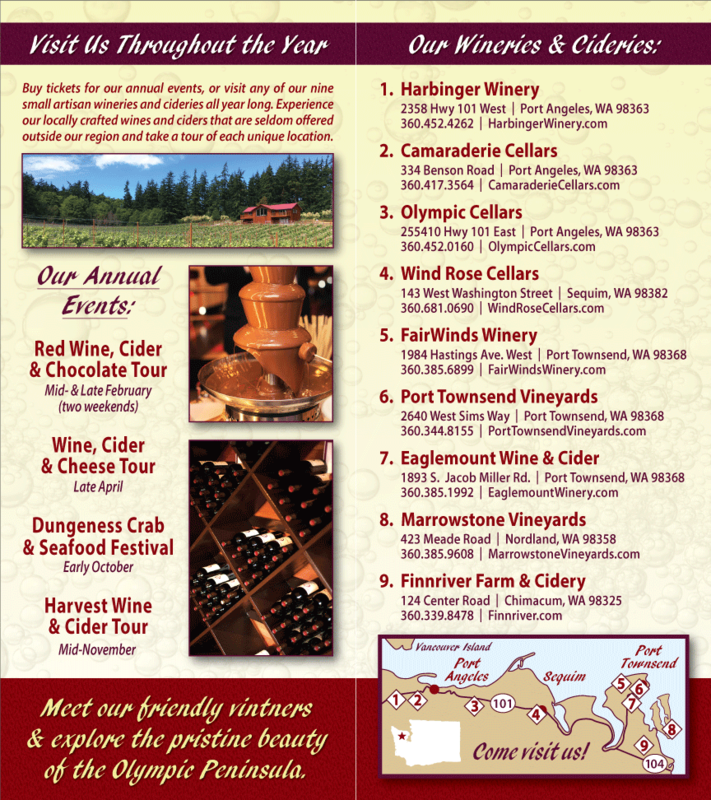 Travel from winery to winery on the majestic Olympic Peninsula, visiting each unique property and explore both Washington wine and the Olympic Peninsula. Tickets are not required to attend this event, however, a $5.00 wine tasting fee will be charged at each winery for non-ticketed visitors. You must be 21 or over to purchase tickets and/or participate in wine tasting. Wind Rose Cellars of Sequim made it’s debut at Red Wine & Chocolate last year, featuring its newly released 2010 Dolcetto. Wind Rose’s wines are made with Italian grape varieties grown in Washington State. These award-winning wines were paired with delicious chocolates crafted by Linda Moates of Sequim’s Cocoa d’Amici. Chocolates samples included Hazel Nut Crunch, Pistachio Fig and Ginger Cinnamon.